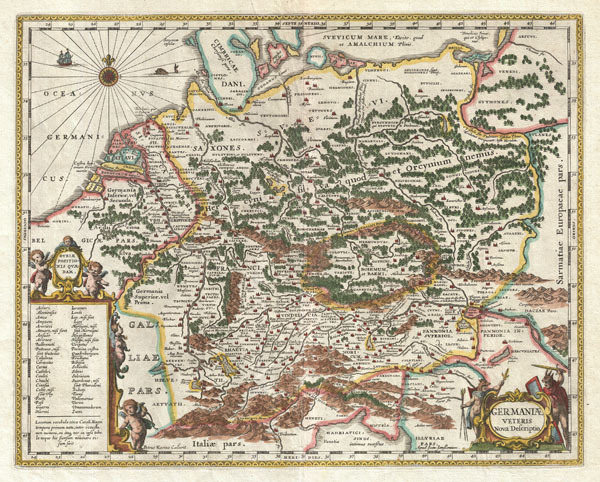 This is a remarkable example of Jan Jansson's 1657 mapping of Germany in antiquity. Depicts a richly forested region covering from Gaul to Dacia and from the Baltic Sea to the Adriatic Sea. Cartographically this map exhibits heavy influence from a very similar map of the same name published by A. Ortelius in his 1597 Parergon. Based on Greek and Roman sources including Pliny, Strabo, Virgil, Ceasar, and others. Ships and monsters decorate the seas. A decorative title cartouche depicting curious warlike figures in animal skins appears in the lower right quadrant. A second cartouche appears in the lower left. This remarkable map was published in volume six, the Orbis Antiquus, of Jan Jansson's Novus Atlas. Koeman, C., Atlantes Neerlandici, Me 177A, 50. Van der Krogt, P. C. J., Koeman's Atlantes Neerlandici, 2000H:1B. Keuning, J., 'The Novus Atlas of Johannes Janssonius', Imago Mundi, Vol. 8 (1951), pp. 71-98, no. 976.